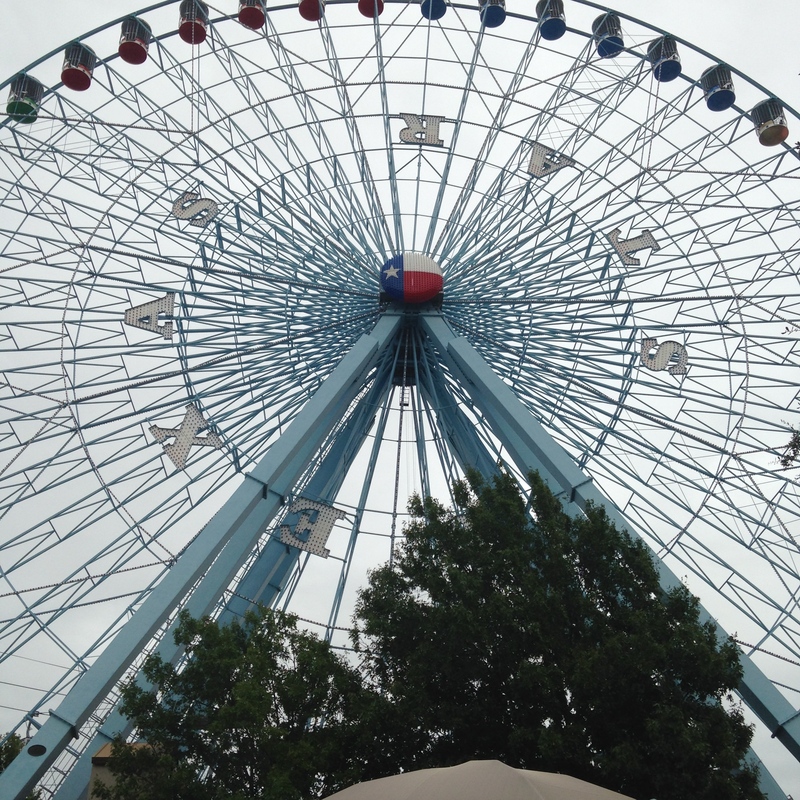 I’m going to go ahead and give my visit to the Texas State Fair the adjective it deserves: epic. I know that’s a big word to throw around. But consider all the boxes I got to check off. 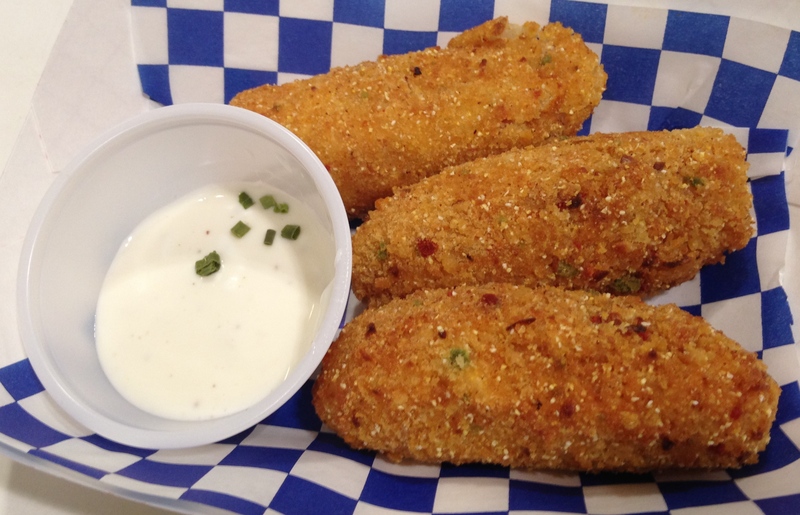 We found and tried all the Big Texas Choice food finalists. I got to spend the day with two friends that I rarely get to see. 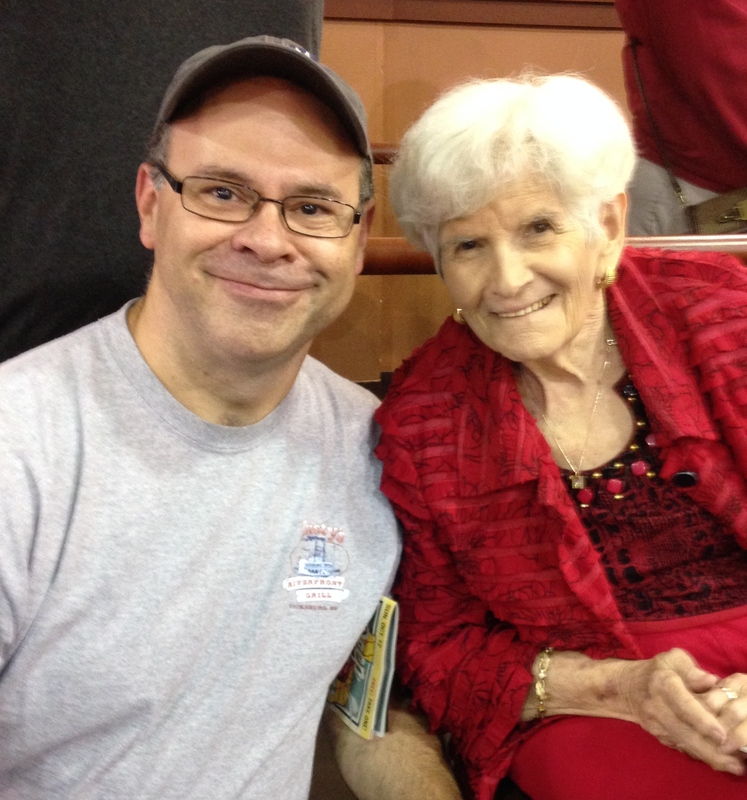 And I met the funnel cake lady. Here’s how it happened. One of the finalists was the Texas Twisted Taco. 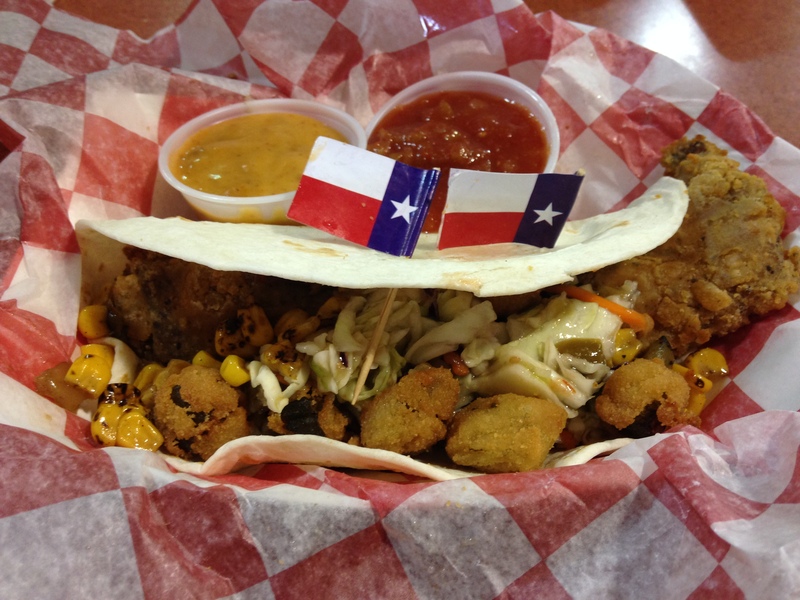 This masterpiece consisted of a piece of Texas brisket dipped in a barbecue sauce-spiked batter and fried, sharing space in the soft tortilla with a tri-color slaw, Mexican cheese, poblano, sweet pepper corn, and fried okra. There was even a chili-cheesey kind of sauce for dipping. At that point of our day, we all agreed that it was one of the best things we had tried. While we were waiting to order, I happened to overhear a gentleman at a nearby table mention something about a table-mate bringing funnel cakes to the fair. It caught my ear, but we moved on in the line and I focused on what we were about to eat. When we finished, I noticed a set of pictures on the wall and what appeared to be some sort of official document – the kind with a plethora of “whereas’s” and whatnot that city mayors use in proclamations to honor folks. I got up to check it out and began to read about Wanda Winter, who had been honored as the first person to ever serve a funnel cake at the Texas State Fair. I also noticed that the lady in all the pictures bore a striking resemblance to the lady at the table where I had been innocently, accidentally and ever-so-politely eavesdropping. 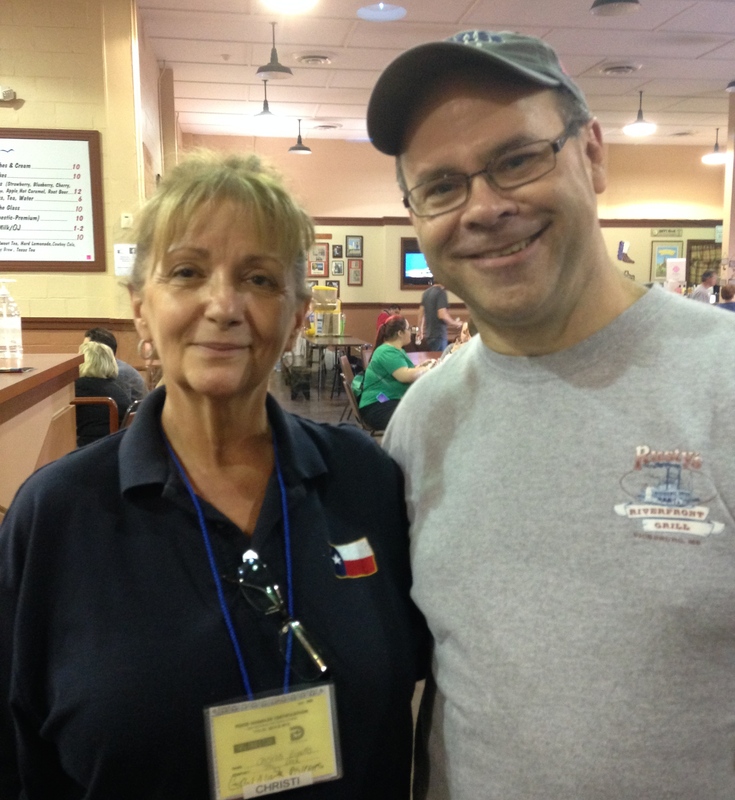 Well, I know an opportunity when I see one, so I promptly made a beeline to her table, introduced myself, and had a little visit with the Famous Funnel Cake Lady. 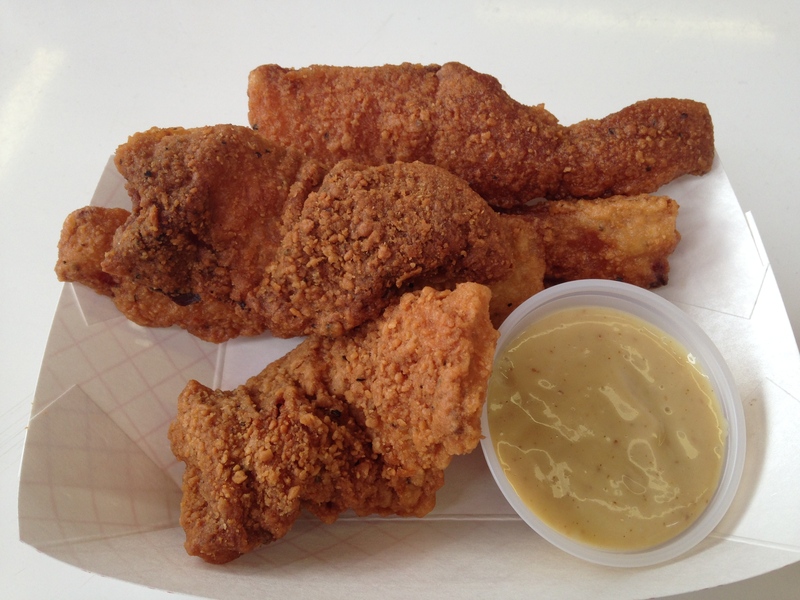 We also noticed that over the years, her little restaurant within the fair had produced several finalists and winners in the Big Texas Choice contest, including the Twisted Texas Taco. As it turned out, it was her daughter, Christi Erpillo, who was the creative mind behind the newest Deep Fried Objects (DFO’s). They got on the phone, found out she was on the way, and we had a nice visit with her, too. She gave us a little tour, told us about some of the previous years’ contest entries, showed us pictures of some of the famous people they had fed, and gave us a preview of a line of unique drinks she was developing. We got the full Twisted Taco Tour. Speaking of winners, I should get you caught up on the other finalists. One was a chicken fried loaded baked potato. Sort of. It was indeed the insides of a baked potato with butter, bacon and cheddar, dipped in seasoned flour and fried. 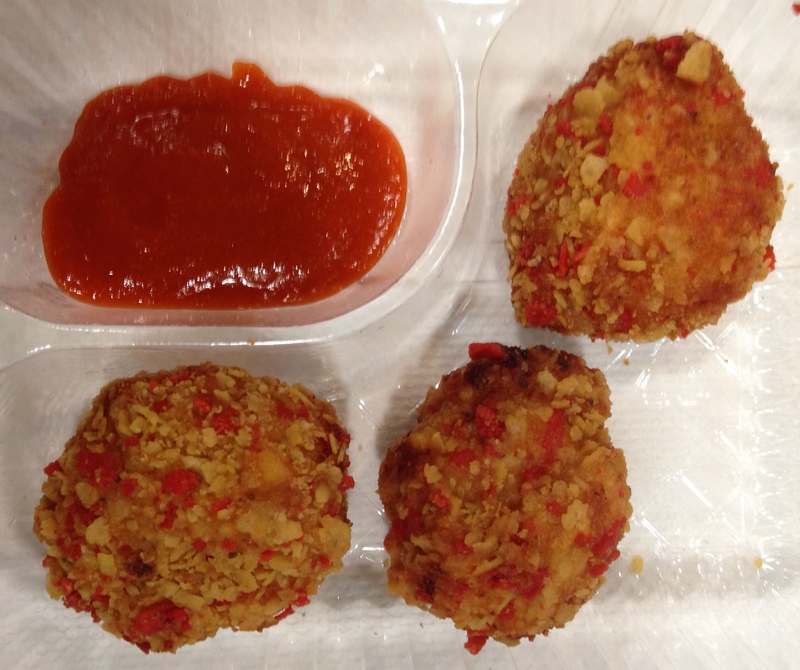 Around the corner were the Sriracha balls. I was a little nervous, what with my taste buds being tender (as we all know by now). But as hot sauces go, I do like the flavor of Sriracha. There was potential. This was a ball of shredded chicken, corn, green chilies and tomatoes- and of course, Sriracha – that had been rolled in crushed tortilla chips (a unique twist) and fried. Though they were a nudge higher on the spicy scale than I usually choose, I loved the concept. Another finalist was Breakfast for Dinner. I couldn’t wait to try this one – I dig tacos for breakfast, and I dig breakfast at any time, so this was right up my alley. 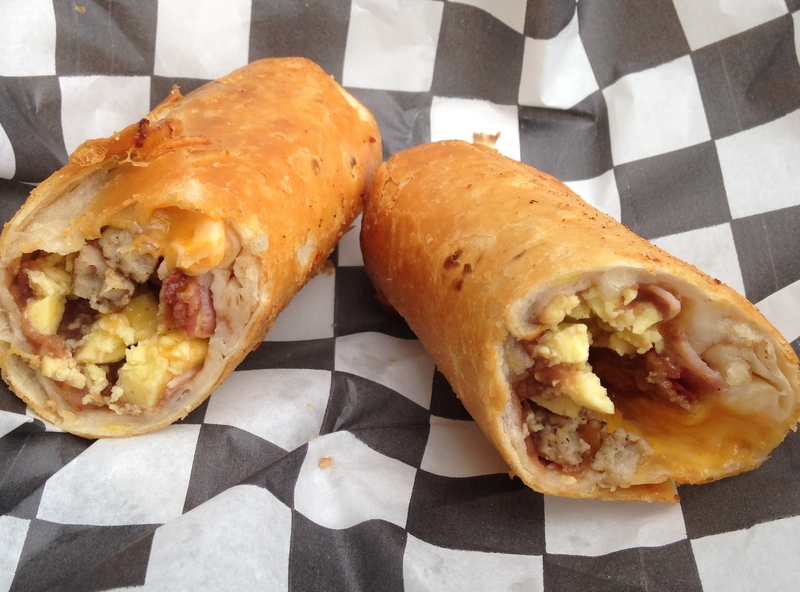 It had everything you could imagine stuffed inside that fried tortilla: bacon, eggs, cheese, sausage, potato, onions, ham, and cinnamon roll bits. My bits of cinnamon roll were undetectable, but it was still a good idea, and a good breakfast taco regardless. 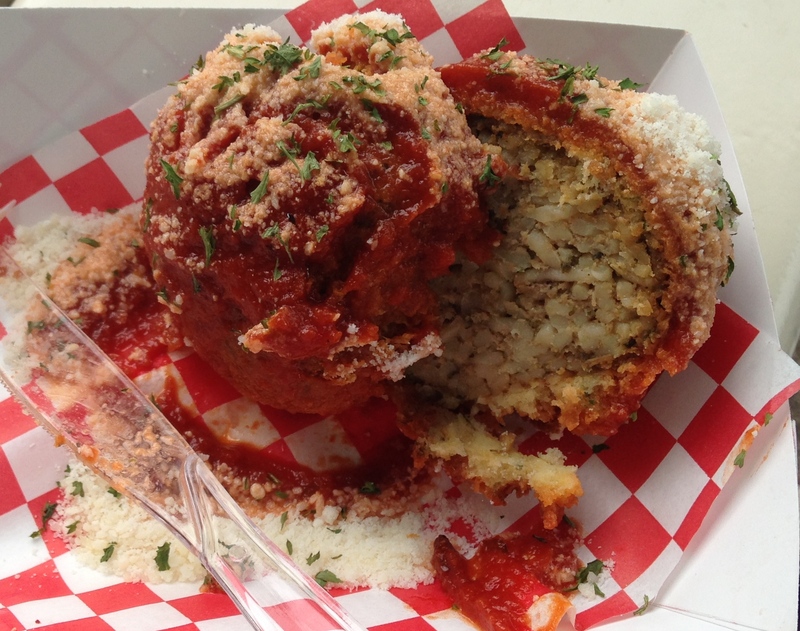 Our first DFO of the day – the gateway DFO – was the Spaghetti and Meatballs: spaghetti noodles, sauce, and meat formed into the shape and size of a baseball, rolled in bread crumbs, fried, then topped with more sauce and parmesan cheese. One of the nice things they did for novices like us was to self-promote. 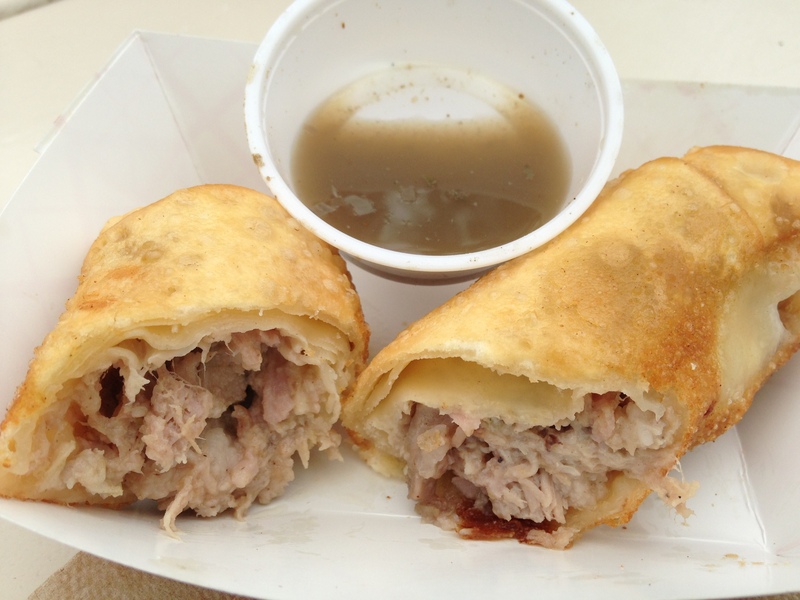 If a particular vendor had won or placed as a finalist in previous years, there were signs – and often they kept some of those prize-winning dishes on the menu. Such was the case with the remainder of our taste tests. After standing in line for the Texas Bluebonnet dessert, we took the opportunity to counter all that sweet with a Cuban Roll: slow-roasted pork, chopped ham, Swiss cheese and pickles, wrapped and – do I even need to say it? Fried. This was one of my favorites of the day, and if you want to know the truth (you do, don’t you? ), it was the pickles that made it work. Aside from a frozen lemonade (a favorite of The Wife and I) and an ice cold cup of Texas-made root beer, that was pretty much our day. We did all the damage we could do in the few hours we could dedicate to the cause. It’s too bad we were full – another dozen or three DFO’s were out there to be tasted. Now that’s a fair. Put it on your calendar now, and next year we’ll get a bus.